Mam Winnie's friend pays tribute to her - SABC News - Breaking news, special reports, world, business, sport coverage of all South African current events. Africa's news leader. Mrs Mokgobo says working with the late mama Winnie was a pleasure. Friend and former colleague of Mama Winnie Madikizela Mandela, known as Mrs Mokgobo says during their days at Baragwanath Hospital, it was great working with her. She told the thousands of mourners gathered at Orlando Stadium bidding farewell the struggle icon that, Mama Winnie took the role of being a social worker beyond the four walls of the hospital. Mokgobo says she would insist that they go into the society and attend to the many people who continue to face social ills and assist them when a need arises. She says indeed the nation has a lost a pillar of strength across the board. 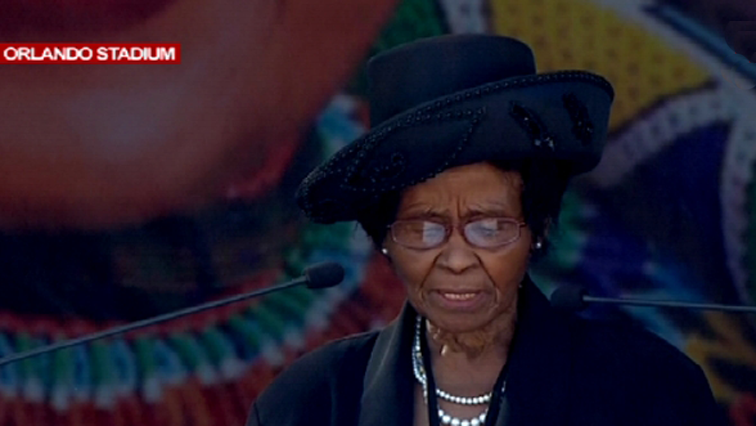 The funeral service for anti-apartheid struggle icon Madikizela-Mandela is underway at the Orlando Stadium in Soweto. The special official funeral commenced with the singing of the National anthem. More than 20 African countries are presented.